With gasoline prices on an upward swing, getting the most mileage you can may mean looking at the most fuel-efficient 2012 family cars. That is, if you’re tired of spending too much cash refueling your current household hauler. We took a look at some of the most fuel-efficient 2012 family cars, starting with the greenest of the green mild hybrids, but not pure electric vehicles and then going to the more mainstream family sedans to see which ones hit the sweet spot when it comes to fuel economy. Our source is none other than the EPA and its Fueleconomy.gov Top 10 EPA-Rated Fuel-Sippers (2012). engine paired with a 111-kilowatt lithium-ion battery pack mated with continuously variable transmission, the Chevy Volt gets a combined 60 MPGe (miles per gallon equivalent), 58 city/62 highway. The Volt qualifies for a $7,500 federal tax credit and may qualify for various state rebates as well. 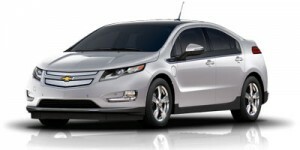 Volt pricing begins at $31,645. 2012 Toyota Prius c – One of the newest variants in the Prius family, the 2012 Toyota Prius c is a compact five-passenger hybrid that gets an EPA-rated 53 mpg city/46 mpg highway/50 mpg combined fuel economy. 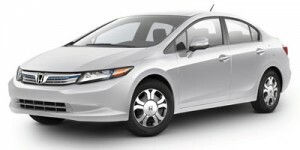 Power comes from a 1.5-liter four-cylinder gas/electric engine. Available in Prius c one, two, three and four models, the 2012 Toyota Prius c carries a starting price of $18,950. most familiar hybrid on the roads today. Toyota says it’s the best-selling fuel-efficient vehicle in the world, with more than 3.5-million sold. Prius is powered by a 1.8-liter engine paired with Toyota’s Hybrid Synergy Drive (actually two motor generators that can power the vehicle solely on electricity). The third-generation 2012 Toyota Prius carries a starting price of $24,000. and high-output electric motor that contribute to a total of 110 horsepower. Prices begin at $24,060. 2012 Toyota Prius v – In the midsize station wagon class, there’s no question the 2012 Toyota Prius v hybrid is family-friendly and very fuel efficient. Coming in at 44 mpg city/40 mpg highway/42 mpg combined, the Prius v makes the grade as a fuel sipper. The hybrid is powered by a 1.8-liter four-cylinder engine, has more load space than the traditional Prius – and all of its eco-friendly virtues. 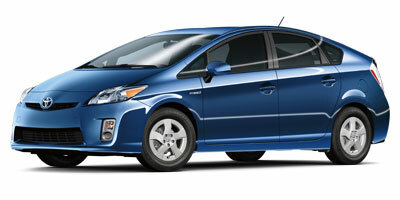 Available in Prius v Two, Three and Five, prices begin at $26,400. 2012 Hyundai Sonata Hybrid – Another highly-regarded family car that’s also a available in a hybrid is the 2012 Hyundai Sonata Hybrid five-passenger midsize sedan. Powered by a 2.4-liter four-cylinder engine paired with lithium-ion battery pack, the Sonata Hybrid achieves EPA-rated 35 mpg city/40 mpg highway/37 mpg combined. MSRP begins at $25,850. 2012 Audi A3 – Best in class in the small station wagon category, the 2012 Audi A3 with its diesel-powered 2.0-liter four-cylinder engine, six-speed automatic transmission gets EPA-rated fuel economy of 30 mpg city/42 mpg highway/34 mpg combined. Pricing for the five-passenger Audi A3 starts at $27,270. 2012 Volkswagen Jetta SportWagen – No surprise here, since the 2012 Volkswagen Jetta SportWagen shares parent Audi’s diesel-powered 2.0-liter four-cylinder engine and six-speed automatic transmission – and the 30/42/34 mpg EPA fuel economy ratings. Content, styling and pricing are quite a bit different for the VW, however, starting at a base price of $20,195. 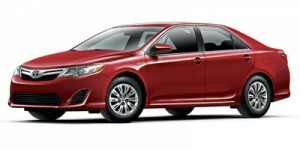 midsize hybrid sedan. Power comes from the 2.4-liter four-cylinder engine and e-Assist technology resulting in EPA-rated 25 mpg city/37 mpg highway/29 mpg combined. That’s enough to go 580 highway miles on a single tank of gas, or roughly the distance from Los Angeles to San Francisco. 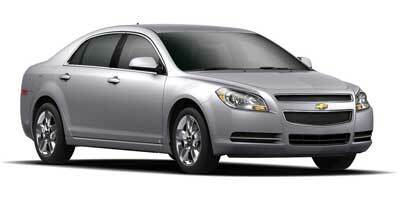 The 2013 Chevy Malibu Eco, on sale now, begins at $25,235.